Pádraig moved to Germany because of the inadequate rehabilitation facilities in Ireland. While the article in the Irish Times Health Supplement on Tuesday, 22 January 2013, by June Shannon is excellent and well worth reading – it’s heading “Home or Abroad – Now it’s your choice” does certainly not apply to Pádraig. He did not leave by choice. To the contrary. Ms Rogers said that although the Government blames the economic collapse for the failure to improve services, many cost-free proposals in its national neurorehabilitation policy published at the end of 2011 still haven’t been implemented. “We’re almost halfway into the three year lifespan of the policy and not only has the crucial implementation plan not been published – the Government still hasn’t even set up an implementation group.” Speaking on the launch video for the RED CARD campaign, supported by members of Sunday’s winning Dublin GAA team, Emma Rogan, a young person with multiple sclerosis, said: “As a young person with a neurological condition in Ireland I am afraid for my future. People have said to me that the best thing you can do if you are diagnosed with a neurological condition in this country is to emigrate”. Mr Macey said that neurorehabilitation services in Ireland are recognised to be the worst in Europe. And even if the improvements being sought were implemented, they would still be worse than those in any other European country with the exception of the UK. “For example, we currently have 7 consultants to serve specialist neurorehabilitation needs across the whole country. But even if we had 50 we would still have the lowest number per capita in Europe with the exception of the UK. And if it increased to 150, we would still be behind countries like Estonia, Latvia, Czech Republic, Croatia and Serbia. “In other words, what we are really aspiring to is not to have services that any country could be proud of, or even services that are mediocre – but to be the second worst country in Europe for neurorehabilitation. Number of rehab consultants ‘well below minimum’ (headline). Dr Áine Carroll, the newly appointed national clinical lead in rehabilitation medicine, said Ireland has less than a third of the recommended number. “We have seven at present and one of those in Cork is on a temporary contract,” she said, adding that the recommended number was 26. We are truly the Cinderella speciality,” said Dr Carroll. The National Rehabilitation Hospital (NRH), the only facility of its kind in the whole of Ireland, has just 119 in-patient beds. “Ireland should have a minimum of 372 in-patient rehabilitation beds,” said Dr Carroll. The doctor stressed that rehabilitation following injury or disease was a basic human right. It was not a privilege and was supported by international legislation. On Friday, 01 June 2012, Niamh Cahill reported in the Irish Medical News about a new facility to be developed. Minister James O’Reilly said that it would take three years to complete. This followed a number of previous plans that had all failed. The following is an extract from this article. A design team is to be appointed in the near future to progress plans to develop a new 120-bed facility at the National Rehabilitation Hospital (NRH). The new facility will be funded by the HSE and NRH Foundation and will take three years to complete, Health Minister James Reilly and Tánaiste Eamon Gilmore revealed during a visit to the Hospital last week. Dr Áine Carroll, consultant in rehabilitation medicine at the NRH, welcomed the announcement and described it as a “wonderful day” for the Hospital. After a lack of funding resulted in the cancellation of plans to develop a new 235-bed, €200 million facility in 2008, staff at the Hospital were disappointed, Dr Carroll said. “We have been advocating for improvements in the patient environment for several years so hopefully this will now be the first of three phases,” Dr Carroll told IMN. “One of the big problems in rehabilitation medicine has been the lack of a political champion to drive the case for improved services forward. But I really feel that we now have those political champions.” Speaking about her role as HSE national clinical lead for rehabilitation medicine, Dr Carroll said that no consultants had been appointed through the programme to date. On Wednesday, 05 October 2011, Niamh Cahill published an article in the Irish Medical News about ‘A Hidden Speciality’ and her conversation with Dr Áine Carroll, at the time HSE national clinical lead for rehabilitation medicine. In that conversation, Dr Carroll states, “There are insufficient numbers of rehabilitation medicine consultants, insufficient access to specialist rehabilitation at a local level, lack of support for primary care teams in managing very challenging cases and lack of support for the patient and their families. Even if a patient has been through the services of the NR H, once they get discharged they’re very often left in a kind of limbo.” – Dr Carroll admits that the number of rehabilitation medicine consultants – six full-time and one temporary – is grossly inadequate for a country like Ireland, which has the lowest number of rehabilitation specialists in Europe per head of population. When I enquire as to why the numbers have remained so low she responds, “that’s a very good question to ask and it’s one that I have been asking since I began working in Ireland. On 14 July 2011, June Shannon published an article in the Medical Independent, Fulfilling a duty of rehabilitative care. Here are some extracts. It is said that a society can be judged by how it treats its most vulnerable members. The Medical Independent reports that when it comes to providing appropriate rehabilitation services, Ireland is neglecting its duty of care. Dr Áine Carroll was recently appointed National Clinical Lead for the HSE’s rehabilitation medicine programme and is also a former Chair of the Medical Board at the NRH in Dunlaoghaire. “Even when we make recommendations about staffing levels and numbers of in-patient beds we are told that we are reaching for the stars and we are not; we are actually reaching for the bottom,” Dr Carroll remarked. “These are the most vulnerable people in our society and our society really owes a duty of care to these individuals. They have long been ignored and it really is time for a revolution in rehabilitation. This has got to change,” she concluded. On Tuesday, 09 November 2010, the Irish Medical News published an article on “The challenges of delivering quality rehabilitation services” which widely quoted Dr Mark Delargy, Medical Director of the Acquired Brain Injury Programme at the National Rehabilitation Hospital (NRH). On Monday, 29 March 2010, the Irish Medical News published “Whatever happened to the National Rehabilitation Strategy“. While this strategy has been published in the meantime, many of the figures quoted have not changed significantly we believe, especially those referring to waiting times of up to one year for ‘complex high need patients’. 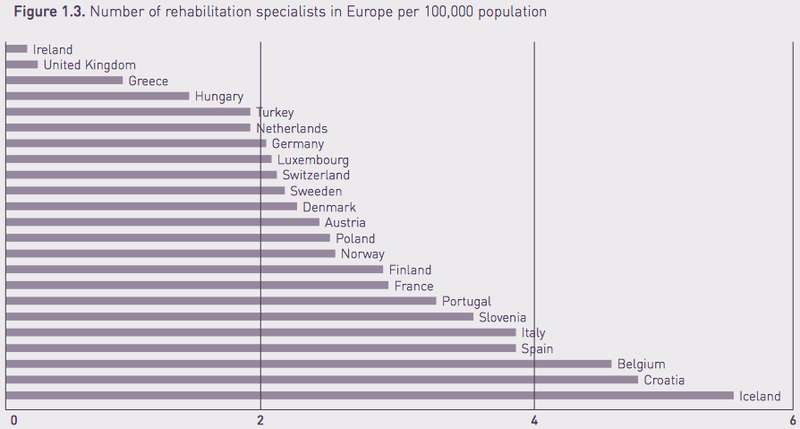 Rehabilitation services and staff numbers in Ireland lag far behind our European counterparts. Services, which span a number of disciplines, are under developed, patchy and geographically uneven with not enough rehabilitation beds, home care or step down care services. Staff wise, Ireland has the lowest number of rehabilitation medicine consultants (7.9 WTE) in Europe, and very low numbers of consultant neurosurgeons (14 approved) and neurologists (24 approved), also at lower end of the scale in Europe. (…) The National Rehabilitation Hospital (NRH) in Dublin, is the largest and main provider of rehabilitation services in the country. However, despite huge demand for its services, it currently only has 110 rehabilitation beds available (it previously had more) for admitting patients and mainly caters for acquired brain injuries including strokes (47 beds), spinal injuries (38 beds), amputations (17 beds) and paediatrics (eight beds). Currently, the average waiting time for an NRH bed for a lower risk patient is between three to six months, but can be as long as nine to 12 months for more complex high-need patients. 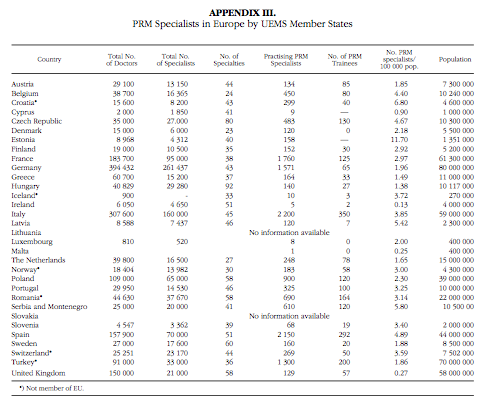 Extract from: White_book_PRM, by Section of Physical and Rehabilitation Medicine, Union Européenne des Médecins Spécialistes (UEMS), European Board of Physical and Rehabilitation Medicine (2006).